Barnes and Noble has launched the Nook Color in the US this week, a full-colour 7-inch Android tablet PC offering the option of reading books, magazines and newspapers, in addition to viewing videos and running apps. Specs wise, the Nook Color features aseven inch 1024x600 full-color LCD touchscreen manufactured by LG, and is accelerometer-enabled – a feature which works in both portrait and landscape modes. The screen is covered with a glare-free laminated coating, in order to provide readers with a more comfortable reading experience than tablet PCs with glossy screens such as the Apple iPad. The Nook Color is also very light, weighing in at under a pound and measuring less than half an inch at its thickest point. It also features 8GB internal memory – more than enough for use as an e-reader – and a microSD slot for additional storage. The Nook Color is Wi-Fi enabled, but not 3G-enabled, with what the manufacturer claims to be a solid eight-hour battery life. 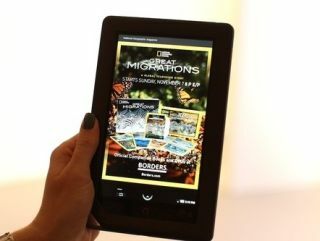 Barnes and Noble is offering full support for the two million and more 'nookbooks' already in its online library. Additionally, magazine publishers including Conde Nast and Hearst, are also on board as partners. The Nook Color will offer over 100 color newspapers and magazines including The Wall Street Journal, The New York Times, Rolling Stone, and Elle. You can also use the Nook Color as a music player while you are reading. The device will NOT use Flash, but will support most other video formats. In terms of apps, perhaps one of the most interesting at launch is a reader's social networking application called "Nook Friends" – so you can share your thoughts with your online book club friends.